One of the most solemn and yet most glorious truths revealed in the Bible is that of Christ’s second coming to complete the great work of redemption. To God’s pilgrim people, so long left to sojourn in “the region and shadow of death,” a precious, joy-inspiring hope is given in the promise of His appearing, who is “the resurrection and the life,” to “bring home again His banished.” The doctrine of the second advent is the very keynote of the Sacred Scriptures. From the day when the first pair turned their sorrowing steps from Eden, the children of faith have waited the coming of the Promised One to break the destroyer’s power and bring them again to the lost Paradise. Holy men of old looked forward to the advent of the Messiah in glory, as the consummation of their hope. Enoch, only the seventh in descent from them that dwelt in Eden, he who for three centuries on earth walked with his God, was permitted to behold from afar the coming of the Deliverer. “Behold,” he declared, “the Lord cometh with ten thousands of His saints, to execute judgment upon all.” Jude 14, 15. The patriarch Job in the night of his affliction exclaimed with unshaken trust: “I know that my Redeemer liveth, and that He shall stand at the latter day upon the earth: . . . in my flesh shall I see God: whom I shall see for myself, and mine eyes shall behold, and not another.” Job 19:25-27. The coming of Christ to usher in the reign of righteousness has inspired the most sublime and impassioned utterances of the sacred writers. The poets and prophets of the Bible have dwelt upon it in words glowing with celestial fire. The psalmist sang of the power and majesty of Israel’s King: “Out of Zion, the perfection of beauty, God hath shined. Our God shall come, and shall not keep silence. . . . He shall call to the heavens from above, and to the earth, that He may judge His people.” Psalm 50:2-4. “Let the heavens rejoice, and let the earth be glad . . . before the Lord: for He cometh, for He cometh to judge the earth: He shall judge the world with righteousness, and the people with His truth.” Psalm 96:11-13. And Habakkuk, rapt in holy vision, beheld His appearing. “God came from Teman, and the Holy One from Mount Paran. His glory covered the heavens, and the earth was full of His praise. And His brightness was as the light.” “He stood, and measured the earth: He beheld, and drove asunder the nations; and the everlasting mountains were scattered, the perpetual hill did bow: His ways are everlasting.” “Thou didst ride upon Thine horses and Thy chariots of salvation.” “The mountains saw Thee, and they trembled: . . . the deep uttered his voice, and lifted up his hands on high. The sun and moon stood still in their habitation: at the light of Thine arrows they went, and at the shining of Thy glittering spear.” “Thou wentest forth for the salvation of Thy people, even for salvation with Thine anointed.” Habakkuk 3:3, 4, 6, 8, 10, 11, 13. When the Saviour was about to be separated from His disciples, He comforted them in their sorrow with the assurance that He would come again: “Let not your heart be troubled. . . . In My Father’s house are many mansions. . . . I go to prepare a place for you. And if I go and prepare a place for you, I will come again, and receive you unto Myself.” John 14:1-3. “The Son of man shall come in His glory, and all the holy angels with Him.” “Then shall He sit upon the throne of His glory: and before Him shall be gathered all nations.” Matthew 25:31, 32. The coming of the Lord has been in all ages the hope of His true followers. The Saviour’s parting promise upon Olivet, that He would come again, lighted up the future for His disciples, filling their hearts with joy and hope that sorrow could not quench nor trials dim. 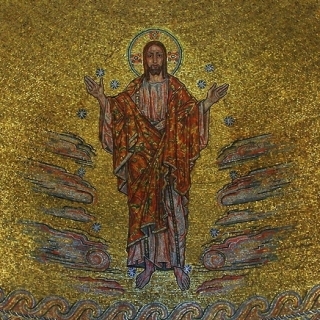 Amid suffering and persecution, the “appearing of the great God and our Saviour Jesus Christ” was the “blessed hope.” When the Thessalonian Christians were filled with grief as they buried their loved ones, who had hoped to live to witness the coming of the Lord, Paul, their teacher, pointed them to the resurrection, to take place at the Saviour’s advent. Then the dead in Christ should rise, and together with the living be caught up to meet the Lord in the air. “And so,” he said, “shall we ever be with the Lord. Wherefore comfort one another with these words.” 1 Thessalonians 4:16-18. From the dungeon, the stake, the scaffold, where saints and martyrs witnessed for the truth, comes down the centuries the utterance of their faith and hope. Being “assured of His personal resurrection, and consequently of their own at His coming, for this cause,” says one of these Christians, “they despised death, and were found to be above it.”—Daniel T. Taylor, The Reign of Christ on Earth: or, The Voice of the Church in All Ages, page 33. They were willing to go down to the grave, that they might “rise free.”— Ibid., page 54. They looked for the “Lord to come from heaven in the clouds with the glory of His Father,” “bringing to the just the times of the kingdom.” The Waldenses cherished the same faith.— Ibid., pages 129-132. Wycliffe looked forward to the Redeemer’s appearing as the hope of the church.— Ibid., pages 132-134. Luther declared: “I persuade myself verily, that the day of judgment will not be absent full three hundred years. God will not, cannot, suffer this wicked world much longer.” “The great day is drawing near in which the kingdom of abominations shall be overthrown.”— Ibid., pages 158, 134. “This aged world is not far from its end,” said Melanchthon. Calvin bids Christians “not to hesitate, ardently desiring the day of Christ’s coming as of all events most auspicious;” and declares that “the whole family of the faithful will keep in view that day.” “We must hunger after Christ, we must seek, contemplate,” he says, “till the dawning of that great day, when our Lord will fully manifest the glory of His kingdom.”— Ibid., pages 158, 134. “Has not the Lord Jesus carried up our flesh into heaven?” said Knox, the Scotch Reformer, “and shall He not return? We know that He shall return, and that with expedition.” Ridley and Latimer, who laid down their lives for the truth, looked in faith for the Lord’s coming. Ridley wrote: “The world without doubt—this I do believe, and therefore I say it—draws to an end. Let us with John, the servant of God, cry in our hearts unto our Saviour Christ, Come, Lord Jesus, come.”— Ibid.,pages 151, 145. “The thoughts of the coming of the Lord,” said Baxter, “are most sweet and joyful to me.”—Richard Baxter, Works, vol. 17, p. 555. “It is the work of faith and the character of His saints to love His appearing and to look for that blessed hope.” “If death be the last enemy to be destroyed at the resurrection, we may learn how earnestly believers should long and pray for the second coming of Christ, when this full and final conquest shall be made.”— Ibid., vol. 17, p. 500. “This is the day that all believers should long, and hope, and wait for, as being the accomplishment of all the work of their redemption, and all the desires and endeavors of their souls.” “Hasten, O Lord, this blessed day!”— Ibid., vol. 17, pp. 182, 183. Such was the hope of the apostolic church, of the “church in the wilderness,” and of the Reformers. Prophecy not only foretells the manner and object of Christ’s coming, but presents tokens by which men are to know when it is near. Said Jesus: “There shall be signs in the sun, and in the moon, and in the stars.” Luke 21:25. “The sun shall be darkened, and the moon shall not give her light, and the stars of heaven shall fall, and the powers that are in heaven shall be shaken. And then shall they see the Son of man coming in the clouds with great power and glory.” Mark 13:24-26. The revelator thus describes the first of the signs to precede the second advent: “There was a great earthquake; and the sun became black as sackcloth of hair, and the moon became as blood.” Revelation 6:12. It was in Spain and Portugal that the shock manifested its extreme violence. At Cadiz the inflowing wave was said to be sixty feet high. Mountains, “some of the largest in Portugal, were impetuously shaken, as it were, from their very foundations, and some of them opened at their summits, which were split and rent in a wonderful manner, huge masses of them being thrown down into the adjacent valleys. Flames are related to have issued from these mountains.”— Sir Charles Lyell,Principles of Geology, page 495. At Lisbon “a sound of thunder was heard underground, and immediately afterwards a violent shock threw down the greater part of that city. In the course of about six minutes sixty thousand persons perished. The sea first retired, and laid the bar dry; it then rolled in, rising fifty feet or more above its ordinary level.” “Among other extraordinary events related to have occurred at Lisbon during the catastrophe, was the subsidence of a new quay, built entirely of marble, at an immense expense. A great concourse of people had collected there for safety, as a spot where they might be beyond the reach of falling ruins; but suddenly the quay sank down with all the people on it, and not one of the dead bodies ever floated to the surface.”— Ibid., page 495. “The shock” of the earthquake “was instantly followed by the fall of every church and convent, almost all the large public buildings, and more than one fourth of the houses. In about two hours after the shock, fires broke out in different quarters, and raged with such violence for the space of nearly three days, that the city was completely desolated. The earthquake happened on a holyday, when the churches and convents were full of people, very few of whom escaped.”— Encyclopedia Americana, art. “Lisbon,” note (ed. 1831). “The terror of the people was beyond description. Nobody wept; it was beyond tears. They ran hither and thither, delirious with horror and astonishment, beating their faces and breasts, crying, ‘Misericordia! the world’s at an end!’ Mothers forgot their children, and ran about loaded with crucifixed images. Unfortunately, many ran to the churches for protection; but in vain was the sacrament exposed; in vain did the poor creatures embrace the altars; images, priests, and people were buried in one common ruin.” It has been estimated that ninety thousand persons lost their lives on that fatal day. “Dr. Nathanael Whittaker, pastor of the Tabernacle church in Salem, held religious services in the meeting-house, and preached a sermon in which he maintained that the darkness was supernatural. Congregations came together in many other places. The texts for the extemporaneous sermons were invariably those that seemed to indicate that the darkness was consonant with Scriptural prophecy. . . . The darkness was most dense shortly after eleven o’clock.”— The Essex Antiquarian, April, 1899, vol. 3, No. 4, pp. 53, 54. “In most parts of the country it was so great in the daytime, that the people could not tell the hour by either watch or clock, nor dine, nor manage their domestic business, without the light of candles. . . . The intense darkness of the day was succeeded, an hour or two before evening, by a partially clear sky, and the sun appeared, though it was still obscured by the black, heavy mist. “After sundown, the clouds came again overhead, and it grew dark very fast.” “Nor was the darkness of the night less uncommon and terrifying than that of the day; notwithstanding there was almost a full moon, no object was discernible but by the help of some artificial light, which, when seen from the neighboring houses and other places at a distance, appeared through a kind of Egyptian darkness which seemed almost impervious to the rays.”—Isaiah Thomas, Massachusetts Spy; or, American Oracle of Liberty, vol. 10, No. 472 (May 25, 1780). Said an eyewitness of the scene: “I could not help conceiving at the time, that if every luminous body in the universe had been shrouded in impenetrable shades, or struck out of existence, the darkness could not have been more complete.”—Letter by Dr. Samuel Tenney, of Exeter, New Hampshire, December, 1785 (inMassachusetts Historical Society Collections, 1792, 1st series, vol. 1, p. 97). Though at nine o’clock that night the moon rose to the full, “it had not the least effect to dispel the deathlike shadows.” After midnight the darkness disappeared, and the moon, when first visible, had the appearance of blood. “That day is a day of wrath, a day of trouble and distress, a day of wasteness and desolation, a day of darkness and gloominess, a day of clouds and thick darkness, a day of the trumpet and alarm.” Zephaniah 1:15, 16. “Behold, the day of the Lord cometh, . . . to lay the land desolate: and He shall destroy the sinners thereof out of it.” Isaiah 13:9. In view of that great day the word of God, in the most solemn and impressive language, calls upon His people to arouse from their spiritual lethargy and to seek His face with repentance and humiliation: “Blow ye the trumpet in Zion, and sound an alarm in My holy mountain: let all the inhabitants of the land tremble: for the day of the Lord cometh, for it is nigh at hand.” “Sanctify a fast, call a solemn assembly: gather the people, sanctify the congregation, assemble the elders, gather the children: . . . let the bridegroom go forth of his chamber, and the bride out of her closet. Let the priests, the ministers of the Lord, weep between the porch and the altar.” “Turn ye even to Me with all your heart, and with fasting, and with weeping, and with mourning: and rend your heart, and not your garments, and turn unto the Lord your God: for He is gracious and merciful, slow to anger, and of great kindness.” Joel 2:1, 15-17, 12, 13. It was not alone upon the hills of Judea, not among the lowly shepherds only, that angels found the watchers for Messiah’s coming. In the land of the heathen also were those that looked for Him; they were wise men, rich and noble, the philosophers of the East. Students of nature, the Magi had seen God in His handiwork. From the Hebrew Scriptures they had learned of the Star to arise out of Jacob, and with eager desire they awaited His coming, who should be not only the “Consolation of Israel,” but a “Light to lighten the Gentiles,” and “for salvation unto the ends of the earth.” Luke 2:25, 32; Acts 13:47. They were seekers for light, and light from the throne of God illumined the path for their feet. While the priests and rabbis of Jerusalem, the appointed guardians and expounders of the truth, were shrouded in darkness, the Heaven-sent star guided these Gentile strangers to the birthplace of the newborn King. It is “unto them that look for Him” that Christ is to “appear the second time without sin unto salvation.” Hebrews 9:28. Like the tidings of the Saviour’s birth, the message of the second advent was not committed to the religious leaders of the people. They had failed to preserve their connection with God, and had refused light from heaven; therefore they were not of the number described by the apostle Paul: “But ye, brethren, are not in darkness, that that day should overtake you as a thief. Ye are all the children of light, and the children of the day: we are not of the night, nor of darkness.” 1 Thessalonians 5:4, 5. The watchmen upon the walls of Zion should have been the first to catch the tidings of the Saviour’s advent, the first to lift their voices to proclaim Him near, the first to warn the people to prepare for His coming. But they were at ease, dreaming of peace and safety, while the people were asleep in their sins. Jesus saw His church, like the barren fig tree, covered with pretentious leaves, yet destitute of precious fruit. There was a boastful observance of the forms of religion, while the spirit of true humility, penitence, and faith—which alone could render the service acceptable to God—was lacking. Instead of the graces of the Spirit there were manifested pride, formalism, vainglory, selfishness, oppression. A backsliding church closed their eyes to the signs of the times. God did not forsake them, or suffer His faithfulness to fail; but they departed from Him, and separated themselves from His love. As they refused to comply with the conditions, His promises were not fulfilled to them.